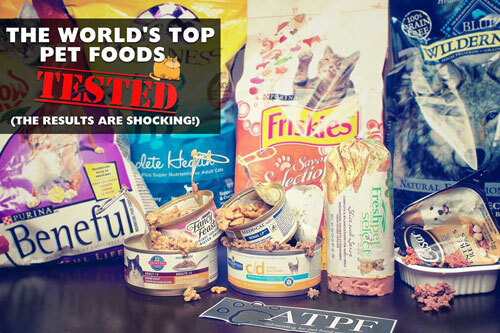 For several months we’ve been on pins and needles awaiting the results of the findings from 12 very well known brands of cat and dog foods, including a few so-called prescription foods. These are all brands you’ve heard of, and some of them are brands many assume are the good ones for our cats. The testing was sponsored by and paid for by the members of the Association for Truth in Pet Food (ATPF), in other words, concerned consumers like you and me who donated money to fund this project. ATPF was founded by pet food advocate Susan Thixton. The qualifications of the people running the tests include: veterinary nutritionists and forensic scientists. Does the word “Mycotoxin” scare you? Us too! The foods tested had varying levels of Mycotoxins in them. Have you heard of group of bacteria called Acinetobacter? We learned that this bacteria is responsible for approximately 500 human deaths a year. You will see that this bacteria was found in 8 of the 12 pet foods tested! And it gets worse: for humans Acinetobacter is 63% multi drug resistant. We are going to wonder out loud for a moment: could some of these human deaths be linked to the handling or eating tainted cat/dog food? If it’s a threat to human health then why are these toxins ending up in cat and dog food? We are paying the FDA and state department of agriculture One Billion Dollars annually nationwide to conduct testing yet they claim they don’t have enough money to test for toxins in cat and dog food! Susan Thixton from ATPF will attempt to meet with the FDA in a week to challenge them on these topics and more. If she’s successful we’ll report back to you with the outcome. Angry? Here’s what you can do today. Call and write to your Congresspersons. Call and write to officials at the local level. If we do not demand change, insist that laws be put in place, and force better enforcement of those laws nothing will improve. Don’t just contact the manufacturers – they may only change if laws which make this illegal are in place. The test results which you are going to see should embarrass the regulatory officials because it proves that they are not doing their jobs. This link will take you the very lengthy and disturbing test results. Below is an article from The Truth About Pet Food that came out today regarding reports of Purina food possibly linked to cat and dog illnesses/deaths over the last two months. If any of your cats or dogs have mysteriously gotten sick or worse please read this article and then report it to the FDA. You can go here to file a report. I’ve heard from many readers concerned of the recent Internet reports of sick and dying pets linked to a Purina Pet Food. I turned to FDA asking if the agency has received complaints on the Purina foods. When an Examiner.com story was published highlighting several recent pet deaths linked to a Purina pet food, I started hearing from many readers. Everyone had similar concerns – is there going to be a recall? The amazing thing is – no one that wrote me provides their pet a Purina product. Everyone’s concern was for other pets – other pet owners. Everyone that contacted me was wanting to help – wanting to prevent pet illness and death. The Examiner.com story was based on pet food consumer reports of sick or dead pets on the ConsumerAffairs.com website. The posts from consumers were heartbreaking and concerning. I turned to FDA, asking if they could tell me if any Purina pet food was under investigation and asking how many adverse event reports the agency has received over the past two months. The Food and Drug Administration welcomes reports from consumers alerting the agency to problems with products regulated by the agency. These reports help the FDA ensure that products on the market are safe and properly manufactured, labeled and stored. FDA encourages those with concerns about a particular pet food product to submit a report to the Safety Reporting Portal: https://www.safetyreporting.hhs.gov/fpsr/WorkflowLoginIO.aspx?metinstance=B4B8DBDBB6CD79D2ED83195A812D1E7D9C329501. Reports of adverse events do not necessarily mean that the product caused the event. Other factors, such as existing disease, exposure to chemicals or contaminants, foods, or other medications may have triggered or contributed to the cause of the event. The FDA takes all of these factors into consideration when reviewing adverse drug event reports. In general, the agency does not discuss its enforcement activities, and any investigation findings would be shared directly with the company. Purina One Cat Food – sick cat. Purina Kit & Kaboodle – 10 cats died. Pro Plan – worms in pet food. Kit & Kaboodle – one cat died. Purina Kitten Chow – one kitten died. Purina Lamb and Rice – sick dog. Pro Plan Dog Food – seizure. Purina One cat food – diminished motor control. Friskies – 2 sick cats. Purina One Hairball – two sick cats. Purina Cat Chow – sick cats and one died. Purina Dog Chow – sick dog. Purina Kitten Chow – 2 kittens died. Purina Cat Food – bugs in food. Purina Pro Plan Puppy – bugs in food. Puppy Chow – puppy died. Purina One Lamb and Rice – bugs in food. Friskies can – ‘grey’ on top wet food. Purina Beyond – sick dog. Purina Cat Chow – sick cat. Purina One Smart Blend – sick dogs. Purina Dog Chow – dog died, another dog died too. Purina One – sick cat. Purina Cat Chow – cat died. In the above list – consumers have reported 19 animals have died. These numbers or reports of sick pets (naming a food) do not agree with what FDA shared. What is going on? The answer is – we don’t know. What we do know is that we need every incident of a sick pet, every pet that has died, and every bugs in a pet food reported to FDA. Every incident needs to be reported. Needless to say, I am not the FDA’s biggest fan. But – the ONLY way for a suspect pet food to be recalled is through FDA and your State Department of Agriculture. If – we consumers – can be pro-active in helping save the lives of pets, this is one way we can help. 1. Seek veterinary care for your pet. Share your concern that you believe the pet food or treat might be the cause. Ask your veterinarian to give their opinion if the food could be related to the illness or death – this is significant information for FDA and other investigators. We need our veterinarians to stand with us. If the pet dies – as difficult as this might be – ask your veterinarian to perform a necropsy. This is evidence. In the midst of your grief, if you believe the food or treat was the cause, you need this evidence to hold the manufacturer accountable. You will need this evidence to possibly save the lives of other pets. If you cannot afford the cost of a necropsy, ask you veterinarian to hold the pets body while you report the issue to regulatory authorities. In some cases authorities will perform the necropsy for you. Make certain to tell regulatory authorities you are holding the pet’s body for this reason. 2. When time allows – document everything. Where and when you purchased the food (keep all food and packaging), when you first noticed symptoms and what those symptoms are/were. Document everything you can recall. DO NOT return the food to the retail outlet for a refund. No investigation can occur without the food/treat and the packaging. 3. File a complaint with the FDA and your State Department of Agriculture (ask to speak to the pet food investigator). Bookmark this page on the FDA website. This is the instructions on how to report the sick pet. 4. Report the incident to the pet food manufacturer. Note: seek veterinary treatment first, document everything, report to FDA before you report to the manufacturer. 5. You can have the food tested yourself at an independent lab or a veterinary school lab. Ask your veterinarian to provide you with what food toxins could cause the symptoms seen in your pet (example: mycotoxins, vitamin toxicity). 6. If you wish to share your story with other websites – share. We all want to warn other consumers when we suspect a problem with a pet food or treat. But please – report the incident to regulatory authorities first, Facebook second. My heart goes out to all those that have lost a pet due to a pet food or treat – I began my path of pet food consumer advocacy because 20+ years ago a dog food killed my beloved dog. I still grieve her death – I still feel responsible. I didn’t know then what I know now, but I bought her this pet food and placed it in her bowl. Something I’ll never forget. Once again jerky treats which were made in China for dogs and cats are making animals sick or causing them to die. You must read labels carefully. Avoid food for your cat or dog that is made in China, Thailand or Vietnam. Often stores will cover up the country of origin with the price tag! Even if a product is made in the US they could be sourcing ingredients from anywhere – including China. And while I have your attention, read the labels, if there is fish on the ingredient list do not buy it – more on “why we no longer consume fish” in an upcoming newsletter. http://truthaboutpetfood2.com/jerky-treat-progress-report – Jerky Treat Progress Report? Yet another Proctor & Gamble cat and dog food recall because of salmonella. Brands: Eukanuba and Iams. See the list. These recalls for salmonella from Proctor & Gamble brands of cat and dog food seem to occur every few months and we are sick of it. March 25, 2013 – Recall of Major Brands of Cat Food Including Evo and Innova! We are disgusted – for the third time Natura has expanded their recall of cat and dog food because of salmonella. All of Natura’s brands are affected – dry cat and dog food and various bars and treats. Brands are Innova, California Natural, EVO, HealthWise, Mother Nature and Karma. Read Natura’s press release here which gives all of the brand names, products, lot numbers and expiration dates for this latest expansion. The recall by Natura because of salmonella contamination has now expanded to include all Natura dry cat and dog foods with a range of expiration dates. A shocking number of VERY popular dry cat/dog foods which are considered to be superior to others have salmonella. The brands: Evo, California Natural, Health Wise, Innova, and the weirdest one: Karma. It’s bad karma that these corporations are so careless with preparing cat/dog food. Read the article for specifics & expiration dates. Also, here’s the first article on the Natura cat and dog food recall.